Click the Map for an interactive Google Map! Here are a few routes in and out of Clarksville, Missouri that are bursting with Fall color right now! This weekend is a great weekend to take a road trip for a pit-stop at Clarksville’s Applefest. Next weekend do the same and land in Louisiana, Missouri for their Colorfest weekend! 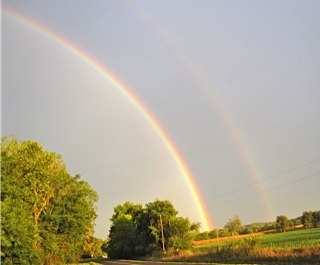 It’s been a while but rain returned recently and I got a couple of pictures sent to me from a few readers living around Pike County. 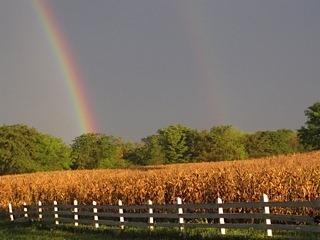 Anyone else have a great Pike County picture to share? Send it my way with a little description of when and where you took it: clarksville_visitor_center@live.com. The Confluence Greenway is set to begin eagle watching season by hosting Eagle Days this weekend! Eagle lovers of all ages are invited to the Old Chain of Rocks Bridge on January 14th and 15th to watch eagles fishing, soaring overhead and roosting in nearby trees. Beautiful Clarksville, Missouri is also ready to welcome eagle lovers during their Eagle Days weekend of January 28th and 29th! Take a beautiful winter drive on the Little Dixie Highway of the Great River Road to reach Clarksville from the north or south. Check out our annotated Google map of the amenities of Clarksville’s Eagle Day weekend. 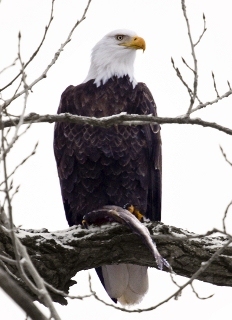 During the winter, the Mississippi River hosts one of North America’s largest concentrations of bald eagles, who are drawn to areas of open water in search of fish, their preferred food. The Mississippi River Lock and Dam #24 located in Clarksville, Missouri is an ideal fishing ground for migrating eagles. Live Eagle Educational Program: Clarksville’s presentation will be at the Apple Shed. Don’t miss this opportunity to be a few feet away from a live eagle! It’s free and gives everyone a chance for a great photo! Eagle Viewing: Spend time on the waterfront with conservation agents and the amazing viewing scopes they bring. Grab a hot drink from town and stand near a bonfire to keep warm. Clarksville Visitor Center will have more viewing scopes, children’s activities, and information about the natural beauty offered near Clarksville. Grab lunch in town at the Eagles’ Bluff Restaurant, Clarksville Station, Bove’s Dry Saloon, or Cool Beans Cafe. Visit Great River & Clarence Cannon National Wildlife Refuges or the new Calumet Creek trail for a more adventurous trip. Binoculars: Short drives or hikes are available for the more adventurous, but you’ll need your own binoculars. Warm clothes, hats, and gloves: If it’s not the 60 degrees it has been! Camera: You have to get a picture of the eagles the conservation brings. They are amazing. Questions: Conservation agents will be here to answer your questions.